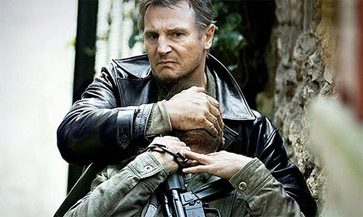 Like Taken, Taken 2 has a few really sharp and original scenes surrounded by one too many ordinary ones. Here is an action series where the creative juices only seem to flow in chunks out of the minds of its writers, Luc Besson and Robert Mark Kamen. The rest of the time, they fall back on painfully traditional chase sequences, hand-to-hand combat scenes and stunts, which, to the audience, function only as time fillers. Perhaps Besson and Kamen, and consequently director Olivier Megaton, figured a little bit of the good stuff goes a long way. Someone should have told them it doesn’t go far enough. The sharp and original scenes I mentioned involve Kim (Maggie Grace), the daughter of ex-CIA operative Bryan Mills (Liam Neeson). Kim, you might recall, was the would-be victim in the first film and Bryan, being the expert and multi-skilled agent that he is, rescued her from a group of Albanians seeking to sell and exploit her. Now the tables have turned and Bryan and his ex-wife, Lenore (Famke Janssen), are the kidnapees and Kim must do all she can to help rescue them. Given this is an action picture, it was a nice twist to see the expectedly scared and weak daughter figure suddenly become a focused and resourceful aid to the hero. Kim climbs onto window ledges; hides quietly in closets; draws intersecting points on maps to pinpoint her parents’ location; detonates grenades in areas so nobody gets hurt; and, when it counts, masterfully drives a five-speed taxi through the narrow streets of Istanbul. Who knew Kim had this in her when she was such a fragile creature the first time around? Unfortunately, the movie doesn’t stick with this refreshing aspect of the premise long enough. It uses Kim only as long as it needs to before Bryan takes over, doing, as he says, what he does best: killing bad guys. That may be what Bryan does best, but it’s not what’s best for the movie’s entertainment value. We’ve simply seen what Bryan does countless times before, so much that it’s gotten to the point where it’s customary.